Is That Really a Target? Junior Cub (7 and under) shoot all their arrows from 15 meters. 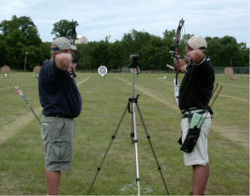 MSAA FITA distances are different from standard FITA distances at the Senior, Youth, Cub, and Junior Cub division levels. The MSAA FITA is not a FITA sanctioned event. For some advice on preparing, read this article on Shooting in Outdoor Target Tournaments. Check out where you fit in with regard to division, class, and equipment.